Friedemodin is a relatively new independent perfume brand created by Nina Friede and Elisabeth Modin (get it? ), "two friends united in London by [their] fascination and love of perfumery." The first Friedemodin collection, Jardin Mystique, is designed to evoke the scents of a garden from dawn to dusk. The four fragrances in this collection — Vertine, Jardin Mystique, Rosée de Nuit and Feu Follet — were developed for Friedemodin by perfumer François Robert. Jardin Mystique is the namesake fragrance of the quartet; it's a green floral with notes of cassis buds, bergamot, cut grass, jasmine, lily of the valley, crushed leaves, patchouli and woods. It's heavy on stemmy green notes and some slightly raspy muguet. I preferred the dry down, once the lily of the valley had faded and I smelled more jasmine and something like linden. Then again, I'm just not a lily of the valley fan; if you are, you might want to give Jardin Mystique a try. Lastly, Feu Follet rounds out the collection (and it's no relation to the discontinued Black Phoenix Alchemy Lab scent of the same name!). Its spicy leather blend includes pink pepper, cardamom, nutmeg, lavender, saffron, leather, amber, patchouli and moss. This turned out to be my second favorite of the four, after Rosée de Nuit. It's dry and very androgynous, with a breath of woodsmoke over its soft, saffron-tinged leather, and it lingers nicely on a scarf or the cuff of a sweater. Friedemodin declares its mission as "combining traditional perfumery with contemporary elegance to create fragrances that are personal, inspirational and tailor-made." These fragrances do feel contemporary, and well-constructed to boot. Still, something about them leaves me slightly un-inspired — maybe just because I don't habitually gravitate towards green, woody or smoky notes. Do you? If so, have you tried this line, and what did you think? 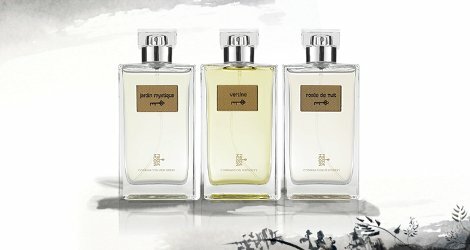 Friedemodin Vertine, Jardin Mystique, Rosée de Nuit and Feu Follet are available as 100 ml ($190) Eau de Parfum via Indiescents and the Friedemodin website. I love green, woody, AND smoky! I want to try these now. Thalia, then you should definitely try to get your hands (and nose) on some samples! They may be right up your alley! Rosée de Nuit sound like something I might like. I do love spicy roses. Smoke — I do not gravitate toward smoky scents. Woody notes — I like woody notes if they smell natural and don’t drown out every other note in a composition within 10 minutes of application. I do sit up and pay attention if a perfume is descibed as green, perhaps because I’m the outdoorsy type? But there so many types of green. Palm leaf in perfume smells like Irish Spring soap to me, and very herbal greens don’t sit well on my skin. Green notes that I like in perfume: the green notes in Seattle Chocolate by Olympic Orchids (silver fir, fir balsam absolute, etc. ), violet leaf (preferably paired with plenty of the violet flower), and grass. I don’t have much experience with galbanum, but it’s in Lush’s Flower Market (FM), and I really like FM.